Are Your Teeth Sensitive? Your Dentist Explains Why! Do you feel sensitivity or discomfort when you take a swig of ice-cold water? What about when you sip your morning cup of coffee? Sensitive teeth can be uncomfortable, and they will make you want to avoid some of your favorite foods and drinks. There are a few things that could be causing your sensitive teeth. Keep reading to learn why your teeth are sensitive and what you can do to help from a trusted dentist. Enamel erosion: Your teeth are protected by a strong outer layer called enamel. Once enamel is worn down, it can cause tooth decay which leaves nerve endings in your teeth exposed. The sensitivity you feel when consuming something hot or cold is caused by the exposed nerves. Cavities: These can also expose the nerves on the inside of your teeth. Typically, tooth sensitivity is one of the first signs that you have a cavity. Receding gums: If your gums start to recede, they can expose a sensitive part of your tooth called dentin. This part of your tooth is much more sensitive than the enamel, which makes you more susceptible to discomfort when eating hot or cold foods. An easy thing you can do to help your tooth sensitivity is to use the right toothpaste. Look for toothpastes containing potassium nitrate. This ingredient can “depolarize” the nerve endings in your teeth and effectively block your sensitivity triggers. It will also help strengthen your protective enamel. Talk to your dentist about which toothpaste with potassium nitrate they recommend. 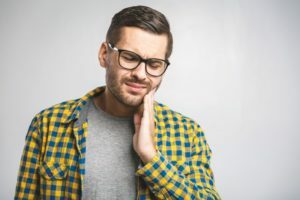 If your sensitivity is caused by a cavity, exposed nerves, or loose fillings, you should seek help from an emergency dentist as soon as possible. Not getting the right treatment can lead to a real dental emergency like cracked or lost teeth. Your dentist will be able to fill a cavity or place a crown over the exposed nerves to alleviate your discomfort. Of course, maintaining a good oral healthcare routine is the best thing you can do to keep your teeth healthy and sensitivity free. Brush and floss your teeth daily and pay attention to any symptoms you feel when you eat or drink cold and hot foods. Now that you know what causes tooth sensitivity, don’t be alarmed if you have a strange feeling when you eat or drink cold and hot foods. Watch out for the causes of sensitivity and use our tips to manage and even get rid of the sensitivity in your teeth! Dr. Nelson Y. Howard enjoys helping patients look and feel better. He knows tooth sensitivity can affect your daily life, so he’s ready with treatments and suggestions to help you. He is also one of 370+ dentists in the world to be an Accredited Member of the Academy of Cosmetic Dentistry. So, if you want to enhance the look of your smile as well, he will provide the best cosmetic services possible. He currently runs his own practice where he can be contacted through his website or by phone at (760) 599-6559 for any questions. Comments Off on Are Your Teeth Sensitive? Your Dentist Explains Why!